Saturday, 3rd March 2012, 10.00 am. Following on the success of Nature’s Treasures meetings 1–3, this, the fourth in the series, was another one-day meeting, co-organized by the Russell Society, the Mineralogical Society, Gem-A (the Gemmological Association of Great Britain), in association with the Oxford University Museum of Natural History. Eighty-five delegates enjoyed an excellent scientific programme in the very welcoming surroundings of Oxford Natural History Museum. We had the usual mix of professionals and amateurs in the audience with a healthy smattering of younger participants schoolgoers in the mix also. The talks were recorded and permission has been given to post some of them here. In one case (J. Ogden), there is no permission to reproduce the slides, but Jack has kindly allowed us to post the audio which is very enjoyable in its own right. Derek Siveter described the project to elucidate the fossils in the Silurian of Herefordshire. These include the preservation by clay of the soft parts as well as the more usual shells. Colleagues have carried out serial sectioning of these creatures and as a result have found aspects of these creatures new to science. Richard Pattrick followed with a history of nuclear power and brought us right up to date with current thinking about the best way, and the likely location for a geological host for legacy, current and future nuclear waste. David Palmer talked about minerals at the nanoscale and described, using polystyrene atoms, the structure of some simple iron minerals. He then went to talk about how our knowledge of how natural materials are formed can be applied to synthetic materials, or how natural materials can be modified for use, e.g. to give us touch screens on our smart phones and I-pads etc. In the afternoon, Bill Perkins spoke about the legacy mine waste in Wales and in Ireland. He described methods, active and passive, to remove some of the problem toxins. Much recent work has been done in this area in order to ensure that waters draining from former mining areas (acid mine drainage) can be remediated in order to comply with the European Water legislation. The talk by Courtenay Smale was a complete departure from what went before as he described the history, older and more recent of the Williams Caerhays mineral collection. There were many wonderful photographs of samples in the collection (almost lost to science) but, as often in these cases, the intrigue was to be found in the people in the story. The Natural History Museum in London and the Cornwall Mining Trust both had their pick of specimens from the collection, leaving us with what is on display in Cornwall today. This really is worth a look! “healing” powers of crystals may have arisen. A fascinating and fun talk. The final talk of the day, by David Pyle, gave a wonderful visual and scientific insight into the world of volcanoes and those who study them. Feel free to view the slides and listen to the recordings using the links below. Be aware that some of the audio files are quite large (up to 20 Mb) but it’s worth the wait! Re-creating 3D models of fossils. Nuclear Waste: we have a problem. Minerals at the Nano-Scale: Exploring our Crystalline World. The Lore and the Profits: Gems, Myths and the Jewellery Trade over 2000 years. There were several displays, including the wonderful exhibit by Andy Tindle and colleague of the Virtual Microscope. Andy also brought along a model of the Beagle II Mars Probe and this prompted much excitement. Continuing the Mars theme, Monica Price of the museum showed a Martian meteorite to interested delegates. Other demonstrations were given by Gem-A, The Mineralogical Society, The Russell Society and Richard Tayler. The organizers are grateful to those who offered financial support for the event, including the Basil Shippham and Alsford Trust, the Russell Society and the Special Interest Groups of the Mineralogical Society. This helps to keep the cost of registration to a minimum. Photos by Kevin Murphy and Roy Starkey. Tomography, the imaging of serial planes through an object, enables capture of the internal and external morphology of three-dimensional objects, for example fossils. This may be performed through a variety of means, ranging from optical methods of serial focusing, or using scanning techniques such as magnetic resonance imaging, and especially through use of X-ray computed technologies. In the case of the exceptionally preserved Silurian fossils from the Welsh Borderland (Herefordshire), numerous tomographic serial images are obtained by fine-scale grinding combined with digital photography. Each set of images then provides the basis for computer reconstruction into a three-dimensional, on-screen interactive, virtual fossil. The Herefordshire fossils are about 425 million years old and preserved in a marine-deposited volcanic ash. They are remarkable in that not only typical shelly fossils are preserved, but also soft-bodied invertebrates, in the round, in spectacular detail. Soft-bodied fossils belonging to the earlier Cambrian Period, from deposits such as the Burgess Shale in North America, have greatly increased our knowledge of the early history of animal life relating to the ‘Cambrian Explosion’ event. However, soft-bodied faunas from the Silurian are largely unknown, and the Herefordshire fauna provides us with a previously unavailable window onto a community that lived some 90 million years later. Derek Siveter did his BSc and PhD at the University of Leicester, a Postdoctoral fellowship at Trinity College Dublin and has spent the last 24 years in Oxford University Museum of Natural History. Officially he ‘retired’ in 2011 as Curator of Geological Collections and Professor of Earth Sciences. The debate about nuclear energy is often heated and one of the issues that is used by those who oppose it is the production of extremely radioactive wastes from nuclear reactors. But whatever our nuclear future is, we already have a legacy of the most complex radioactive wastes in the world, from our various nuclear power plants and from our nuclear weapons programmes. In 2008 the UK government decided that we would place our intermediate and high-level waste in a ‘Geological Depository’ and are now actively seeking a site where a facility can be built 200-1000 m underground. Recent waste is well characterized but early wastes from nuclear activities starting in the 1950s was thrown into ponds where it lies rotting and is of unknown composition. The plan is to build a multi-barrier system that will protect the environment from the wastes for 1 million years. In each of these barriers, minerals are key. The first barrier will make the waste into a stable form, and many mineral structures are being examined. The second barrier is a stainless steel canister, perhaps packed with clay. The third barrier is the cement that forms the underground caverns which will also be backfilled with cementitious materials. The final frontier is the rocks in which the Facility is to be built. Dealing with our current and future radioactive wastes is one of the UK’s great challenges – geologists and mineralogists will be key to meeting that that challenge. The beauty of natural crystals extends far beyond the polished faces of hand specimens, and into a microscopic realm of atoms and chemical bonds. These crystalline structures are highly complex, but can be understood in terms of different assemblies, or polymerisation, of chemical units: the “Lego” bricks of the mineral world. By understanding this natural “crystal engineering”, we can appreciate controls on properties and stability, and exploit our Earth’s treasury of natural crystals in new, high-technology materials of the future. In the spring of 2008 Charles Williams, the owner of the Caerhays Estate, was decided that a display of the family’s minerals would be a desirable addition to the house tour at Caerhays Castle. Brought from Scorrier House to Caerhays in 1863, a large portion of the collection was presented to the British Museum (Natural History) and other museums in Cornwall in 1893 by John Charles Williams, the then owner whose interest lay in plants, not minerals. A selection of minerals was retained by the Williams family at Caerhays and contains some of the finest known secondary arsenates and phosphates. This selection was eventually taken off display and stored in numerous locations throughout the castle, and until 2008 had not been seen in living memory. As owners/managers of many tin and copper mines, particularly in the Gwennap parish in the late 1700s and early 1800s the Williams family were well placed to acquire the classic copper arsenates, many of which have not been bettered worldwide in 200 years. Later additions to the collection were made in the mid 19th century, comprising purchases from British and European mineral dealers, including a fine thumbnail collection, commissioned from Bryce McMurdo Wright, snr. around 1860. The current display at Caerhays is the result of the painstaking restoration of a superb collection, considered in its heyday to be one of the finest assembled in Cornwall, rivalling that of Philip Rashleigh of Menabilly. Courtenay Smale is a graduate of the Camborne School of Mines and before retirement was a Fellow of the Institution of Mining and Metallurgy. He is a Past President of the Royal Institution of Cornwall, the Royal Geological Society of Cornwall, and of the Cornish Institute of Engineers. He was elected a Bard of the Gorsedd of Cornwall in 1983 in recognition of his contribution to the Mineral and Mining History of Cornwall. A schoolboy interest in worldwide minerals led to him later specialising in the Arsenates and Phosphates of Cornwall. Since June 2008, at the invitation of the owner of the Caerhays Estate, he has been working on the restoration of the famous Williams Mineral Collection at Caerhays Castle and is currently its curator. 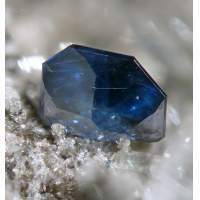 For thousands of years, gems and minerals have had a variety of myths, magic and medicinal properties attributed to them. Scepticism about this gem lore is not new – the Roman writer Pliny was outspoken about the ‘untruths’ regarding gems expressed in his day – and modern gemmologists typically pour scorn on such things. However, closer examination shows that there can be reasons for at least some of the associated lore – some scientific, some amusing. Certain attributes associated with Gems in Medieval times can be seen to be simple misunderstandings of what classical writers were trying to say, in other cases some medical properties may indeed be based on truth. Of the apparent ‘untruths’ some were presumably those used by charlatans to sell cures, others may simply have been the exaggerated claims of those marketing jewellery – an approach that is hardly unknown today. This talk will consider some of the background to the lore of gemstones in the context of 2000 years of jewellery and show that however sceptical one might be, it provides fascinating insight into gem history as well as providing a wealth of anecdotes that even the most ardent ‘non-believer’ can use to weave history and interest around the gems they are exhibiting or selling.